Andrei Alexandrescu is the co-designer of the D programming language, technical author and research scientist at Facebook. He is also one of the world's C++ (and D...) template masters. 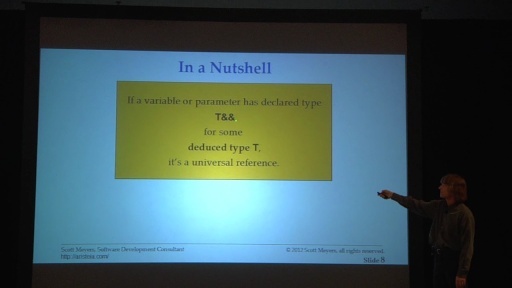 His talk on PBD (policy based design) incorporated the mind bending use of variadic variadic template templates. As Gilad Bracha says, learning is brain damage.Thanks for the headache, Andrei! 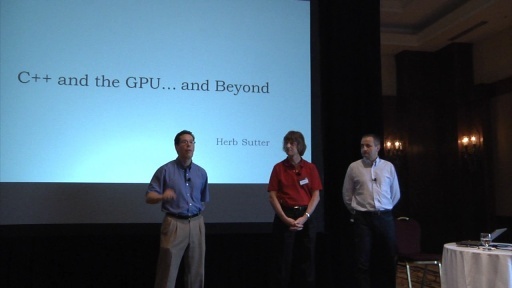 Herb Sutter runs the C++11 ISO committee and is one of the world's leading C++ authorities. Congratulations to Herb and the rest of the people involved with pushing the language forward on the recent ratification of the C++11 international standard (treaty)! Herb's also Microsoft's architect for native programming languages, with an emphasis on C++. We'll find out here what Herb thinks of D.
Much thanks to Scott, Andrei and Herb for allowing me to randomize them right after the event ended to film this conversation. We spend a fair amount of time exploring the Beyond part of the equation. I know Niners will be extremely pleased to see three C++ titans appearing on C9 at the same time! Excellent. [17:25] What problems does D solve that C++ can't? [26:01] Herb, ISO C++ Committee's next phase - what are you going to do? 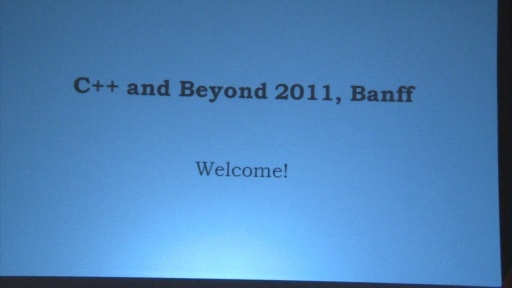 PS: If you can attend the next C++ and Beyond, whenever it may happen, I can't recommend it highly enough. Go. 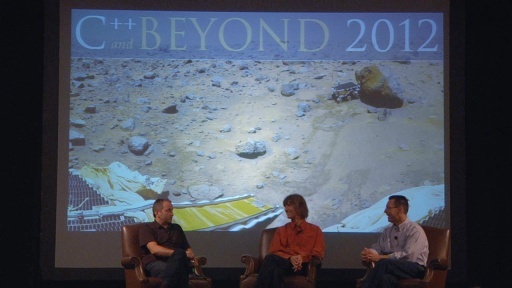 Follow @cppandbeyond to get updates and info on when/where the three amigos will get together again. All are my heros ! downloading it ! Totally. These dudes are mythic! Downloading. Sweet! Downloading. Can't wait to see the C++&B coverage. I really would have liked to have been there. @new2STL: There were incidents (like technical difficulties) in addition to the presenters not wanting to share their material broadly. I respect that given how much work they put into the unique material they presented. 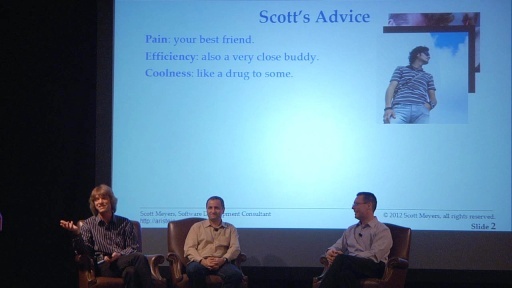 Besides this post, you will probably see one or two Herb sessions, three panel sessions (with the three amigos) and some attendee interviews. Yeah, I found that site (ironically enough) the same day the event was going on. Oh well. A day late and a dollar short yet again. @ryanb: Well, you will at least get to see some content. It's a whole lot better than none. I thought this conversation, specifically, was killer. Your video does not work in FF6. This is just unacceptable. @Michail: sure it does.. Click on one of the download inks (mp4). The inline player should default to HTML5 if you don't have Silverlight installed. The time links won't work without Silverlight I believe. I'll check on that. Please do watch this! It's a classic! Torrent downloads would be nice. I have more respect for Herb every time I hear him speak. He is both pinpoint accurate and eloquent (not to mention fiercely intelligent). He mentioned in another interview you did that he could imagine another native code language with the same semantics as C++ but with nicer, easier to parse, syntax. I think that is the real way to go, as much as I am enjoying the new features of C++11. D is definitely interesting, particularly in the way you can write normal looking code that will run at compile time. One thing that seriously puts me off though is that it is unclear whether you can use the standard libraries without garbage collection enabled. Libraries are the place where your cleanest and most efficient code belongs! It was very interesting to see the three of them together like that. It's easy to see how they all bring a different perspective which can only be a good thing. 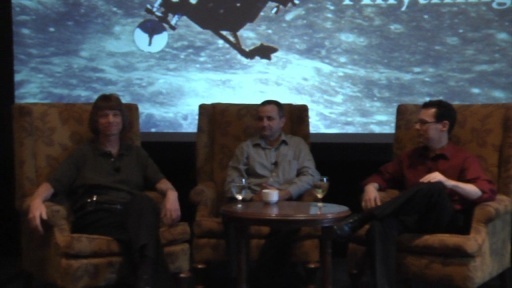 Great to finally see Scott Meyers, Andrei is very engaging as interlocutor and it's always good to see Herb. who can lent me c++; and how i can save it?? @Ducanma Would it be possible to add WebM or Theora? Granted the list of downloadable formats is already long. COM is good? Say no more. You guys have been in MS camp for way too long. Anything else you say at this point should be taken with a grain of salt. @Super Mario: I don't know anything about the D language but I think they were only referring to the use of the vtbl as a mean to expose object interfaces across languages. Not the whole of COM. Perfect episode, keep it coming. it was Erwin Unruh, who "discovered" meta template programming in c++. True! Thanks, we spaced on the exact name -- it was indeed Erwin Unruh, back in 1994. His site has both the original program( http://www.erwin-unruh.de/primorig.html -- no longer valid C++ code ) and an updated version ( http://www.erwin-unruh.de/Prim.html ). Thanks, "true". Erwin Unruh indeed. In our defense, his name contains all of the letters in "Uwe" :o). @andrei_alexandrescu: Welcome to C9, Andrei! @Alexandre Jasmin: we've considered it. I'm pretty sure we don't need to list the WMA (one audio format is sufficient for the download list) so it wouldn't really be a UX issue to add one. I started looking at the state of encoders a few months back, perhaps I'll revisit it. It would be nice if our HTML 5 support worked across a few more browsers. It's an interesting discussion touching on C++ and D advancements. Those two look to me similar to old MS/Apple story. One was practical and powerful, another was more elegant than practical. But as it always happens in life, sooner or later the "practical" hits the wall of diminishing returns, and will have to redirect the efforts toward the "elegant", only to find out that it's always easier to go the other way around. 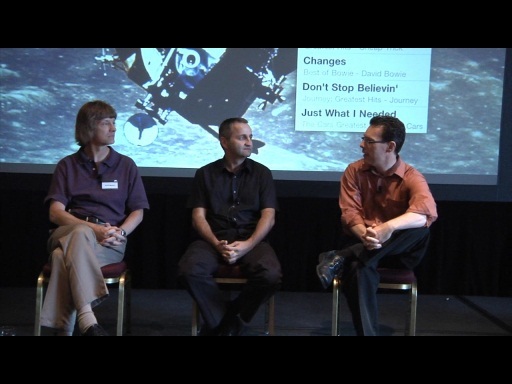 @rab36: In terms of books, you'll learn about that during one of the 3 panel discussions with Herb, Andrei and Scott that will appear on C9 over the coming months. Much thanks to the three titans for allowing us to air them. 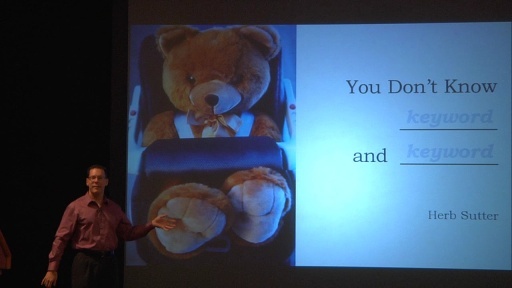 In terms of C++ conferences, I have a feeling you'll see more of them in the future.